Give your bedroom the look and comfort of a village inn with the Amish Queen Anne High Boy Dresser. This heirloom quality Queen Anne High Boy Dresser was featured in the March 2011 issue of Country Living Magazine! 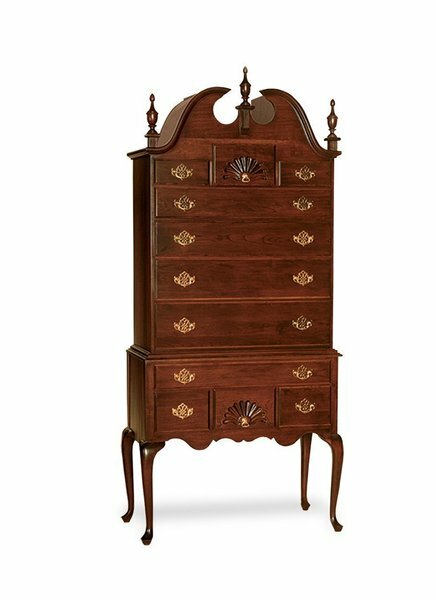 This Amish made High Boy Dresser is elegantly designed in the Queen Anne Style to create a tie with the past as well as a promise of an heirloom in the future. Amish handcrafted in the USA, this Queen Anne Highboy Dresser has a gorgeous carved bonnet top that is over seven feet high! The Queen Anne Highboy Dresser drawers feature premium dovetailed joints for years of everyday use - standard! Choose between Chippendale furniture hardware, brass bail hardware or wheat pulls. This Amish dresser is available in your choice of oak wood, cherry wood, or brown maple wood with a wide variety of finish options! Call DutchCrafters to receive finish samples if you are matching this piece up to existing furniture! Please call DutchCrafters with any questions you may have on this solid wood dresser, or would like to call about other options available. Our fully staffed team of Amish Furniture Specialists will be ready to assist you in any way possible. Toll-free at 1-866-272-6773. I couldn’t be more pleased with the stunning Queen Anne High Boy Dresser that was delivered today. It’s just superb, yet it is only topped by your attentive and gracious staff, especially Valerie. Thank you, thank you for such a beautiful piece. It most certainly qualifies as a family heirloom!